Here is a rare example of occult book publishing from the early 20th century Germany. It stems from the occult movement called Adonism (Adonismus) founded by Dr. Musallam in the 1920s. In order to highlight its significance for a non-German occult audience let me begin with a diversion - and explain a few things on Adonism and its founder. Both of them have been forgotten almost entirely these days for all the wrong reasons. I hope you enjoy these traces of our past. Despite being buried in oblivion by most of us today, Dr. phil. Franz Sättler was quite a remarkable figurehead of the 20th century German speaking occultism. Born on 7th March 1883 in Brüx, Bohemia and deceased about 1942 in Nazi captivity, Sättler during his lifetime was not only a remarkable and highly gifted orientalist, travel writer from the Orient and co-author of the first German-Persian dictionary, but also a spy, a magician, a dealer in occult books and services, a social reformer, a rebel for sexual freedom and - obviously - the founder of the cult of Adonism. Surprisingly, the English Wikipedia page on Adonism provides a better overview than the German one does, and I strongly recommended for further reading. Sättler, or Dr. Musallam as he liked to call himself, claimed that Adonism was the attempt to restore the ancient Ur-religion of mankind. He looked upon it as the genuine essence and true cosmology behind the ancient cults of the Chaldeans, Babylonians and Zoroastrians - traces of which can still be found in active practice, according to Sättler, amongst the Yezidi and Nusayris. During his extensive travels in the Middle East, Sättler claimed to have been initiated into its last surviving order 'Nizam el-Khaf'. There - in a mystical land called Nuristan, different from the region of the same name in Afghanistan - he was allowed to enter the sanctuary of Bit Nur - the House of Light - where the ancient records of Adonism are safely hidden from the world. Today's significance of Sättler's works might be found less in his practical magical instructions as conveyed in his 'Zauberbibel', but rather in the gnostic-luciferian mythology he creatively re-wrote and spread amongst occult circles in the early 20th century. Strong echoes of it can be found not only in the teachings of Wilhelm (Rah Omir) Quintscher - who continued to proclaim himself an Adonist even after his fallout with Sättler - but also in the mythology of the Fraternitas Saturni. Moreover - while oriental in its language, code and context - the gnostic-luciferian mythology of Sättler's Adonism itself can be understood as an echo of earlier works of the German occult tradition - in particular such as Georg von Welling's 18th century 'Opus mago-cabbalisticum et theosophicum'. Furthermore, strong parallels can be identified between the eroto-magical instructions of Adonism and the teachings of P.B. Randolph and his Brotherhood of Eulis. However, as H.T. Hakl states in his brilliant introduction to Sättler ('Der Adept', AAGW 2004) it is unlikely that Sättler copied from Randolph's writings; instead further research will need to validate if not both streams of occult transmission originally emerged from independent visits to the Nusayri sect and genuine insights into their occult inner teachings. Adonism still represents an important link - even though in a new guise - in the chain of the occult tradition of the West. In its unique creative form and yet founded upon Sättler's profound oriental scholarship it weaves together aspects of Chaldean, Egyptian, Yezidi and Gnostic mythology into one consistent modern hole. It's origin story of the mysterious order Nizam el-Khaf, the hidden land of Nuristan and its secret library of light, enriches the corpus of Western occult folklore created in the early 19th century in order to establish an authentic claim of occult lineage. In this respect Sättler's works stand shoulder to shoulder with the origin stories of the Theosophic Society and its secret Mahatmas as well as the mysterious Fräulein Sprengel of the early days of the GD. Additionally, research on Adonism today is not only relevant through an occult lens, but also from the perspective of early 20th century social reforms. According to the zeitgeist of the early 1900s many occult orders promoted an attitude of promiscuity either in secrecy or public - accompanied with or disguised by pseudo-tantric or -gnostic sexual practices. Neither of them to my knowledge, however, took such a deliberate and outspoken stance for equal rights of women and even gays in public as Sättler's Adonism. In fact this little known occult current anticipated most of the social reforms of the late 20th century in the 1920s already. Just pause for a moment and read through this list of things Sättler fought for - even though it remained a loosing battle for him in person: a claim for the legal right to divorce for both men and women, equal voting and general legal rights for both genders, general right for child custody for women, mandatory sexual education of the youth, a legal right for abortion up to the 3rd month of pregnancy through an acknowledged doctor, the requirement to report any sexual disease to the local authorities and free adequate treatment of it, equal rights for non-married couples in lasting partnerships as well as partial equal rights for all gays. Finally, the very question whether Adonism is an authentic religion or the intricate work of a single man, should be read and answered in context of another man's endeavour to create his own genuine religion across Europe at the same time: Aleister Crowley and his Law of Thelema. Judging Sättler's work not according to standards of ancient authenticity, but according to the intricate depth of mythology he synthesised from the vast archives and imagination of his Oriental mind, his work easily might surpass the opus of his much more famous contemporary. An example of occult book publishing the early 20th century. With the above context in mind, let’s take a look at a unique example of occult book publishing from the early 20th century. In the mid-1920s Franz Sättler began to publish his works through his own publishing house, the Adonistischer Verlag Berlin-Weissensee. Two of these works in particular were considered ‘secret books’ by Sättler, i.e. books that contained occult knowledge only to be shared amongst genuine students and followers of Adonism. These were Dr. Musallam’s comprehensive, seven-part ‘Zauberbibel’ (The Sorcerer’s Bible) as well as the book of Adonism itself (Adonismus). Therefore, during the early days of the publishing house each individual book of the small print runs was manually sealed by use of ribbons of cloth as well as black wax-seals - carrying the seal of the Adonistic society. Before their recipients were able to begin reading the book, they ritually had to break the seals - or alternatively cut the ribbons to keep the seals intact. Thus a bond of transmission - or occult chain - was supposed to be established amongst all readers of these arcane works. In addition to the knowledge stored in them, the physical books became part and carriers of an occult current. Whether we want to follow this romantic version or instead prefer to understand the sealing of the books as a smart marketing campaign, is of course up to everyone of us. One could easily argue that the print runs weren’t so limited because of Sättler’s desire to keep the knowledge contained in it secret and arcane - but for much more profane reasons: a lack of initial funds and broader audiences. Equally, during a time where many new spiritual movements such as the Theosophic Society, the Pansophic movement, the early Fraternitas Saturni, Crowley’s OTO and many others were all fishing for financially strong readers and - even better - devote followers, one had to find ways to stand out and create unique selling points! Either way, the rare remaining copies of originally sealed books by the Adonistic society remain artefacts of our more recent occult history in the West. We can choose to look upon them as genuine, physical expressions of a unique 20th century occult current - or as a testament of the fact that the occultist’s naive desire to be part of something special, grande and arcane will hardly ever change. and its original black wax-seals. originally sealed front-page of the book. strips of cloth were used to 'seal' the book and ran from the front of the book around the interior of the back, locked in place through four black wax seals. the initials are surrounded by a snake whose head is pointing towards two stars; the snake both represents the Arabic letter Qaf as well as a symbol possibly derived from the secret cults of the Yezidi or Nusayris. The two stars are symbols for the Adonistic ideals of freedom and truth. ... as we can see from the last image, in later editions of the publishing house the same seal was used as a stamp - as wax seals proved to be too fragile for shipping as well as too time consuming to imprint in every single book. 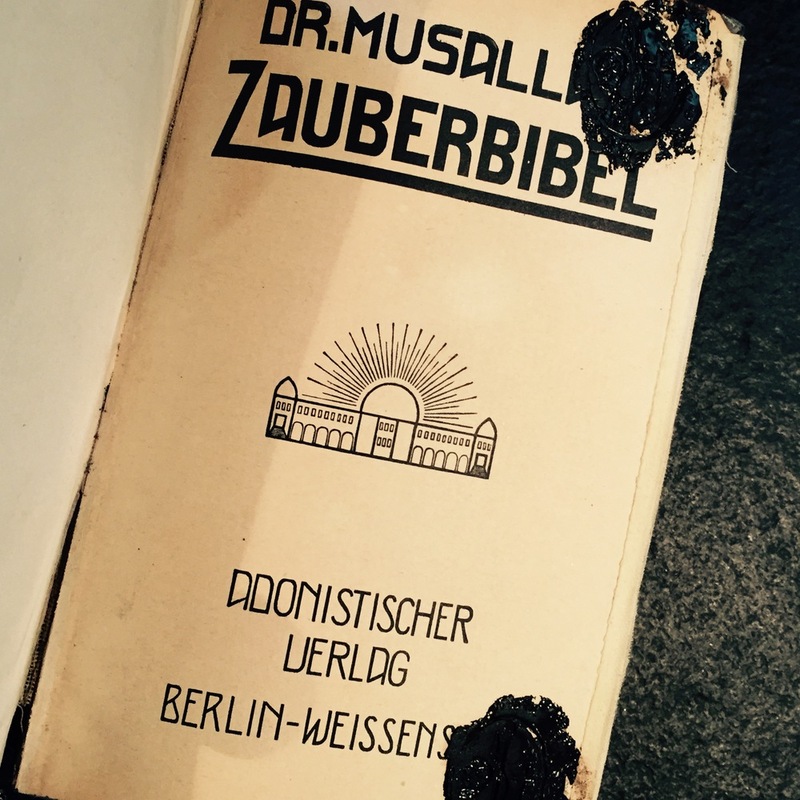 original 1925 first edition of Franz Sättler's, aka Dr.Musallam's Zauberbibel - two black wax seals applied to 'lock' the book. back of the book where two additional wax seals kept the cloth-ribbon in place that was used to 'lock' the book before cutting it open by its student. it is made up of three elements in an elongated shape: a skull to the left, a cross to the right and an oblong middle shape, resembling a flower, flame or sword.